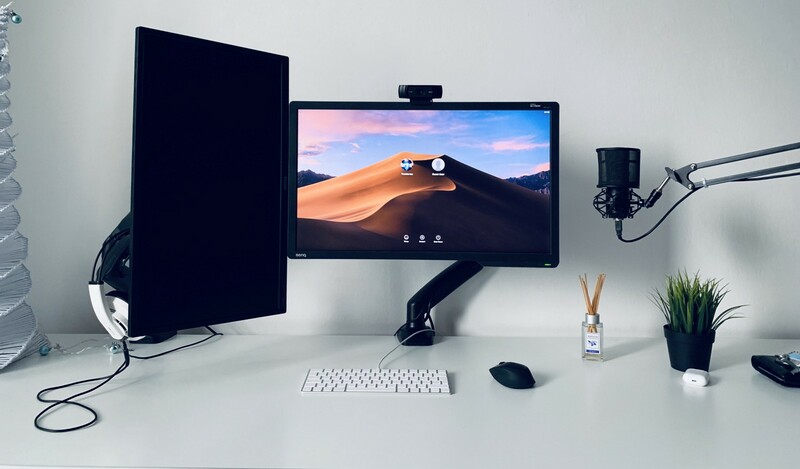 Since my team decided to work at least 2 days in a week from home, I’ve managed to setup my home office, because before, it was used like 2 days in a month, Iwas using my MacBook mostly but now I’ve made a little makeover. I’m working as web developer, so my setup is place where I spend most of my time during the day. I like to work in minimal and clean workspace, which can turn of course into a very messy place during the entire day, but at the end of the day, I’ll clean it for next day. I’m working mostly on back-end stuff with old but still good PHP, and also I like to play around with go, python, ruby and c#. My setup is dedicated just for developing so there is no need of any other stuff. I have a tree with some bulbs on it, on the left side. It can create very nice ambient light in night, then I’m using two benQ monitors, which are both fullHD, and one is rotated vertically. I’m mostly using it just for spotify, slack and discord, and then there is a main monitor, where all the work is happening. My headphones of choice are Superlux HD681, they’re really in budget, but they sound really good, also Lewitz C100 is my budget mic too. I’m using apple magic keyboard and logitech wireless mouse. I wish i can use magic keyboard wirelessly and not through the cable, but since my hackintosh doesn’t have bluetooth adapter, I can’t. And also notice plant on the right side. His name is fred. Cool guy, he’s debugging with me, because he’s only one who’s really listening to me. Then I can realise my errors more quickly. This method of debugging is called Rubber duck debugging. I’m using VSCode and i’m just surprised from day to day. 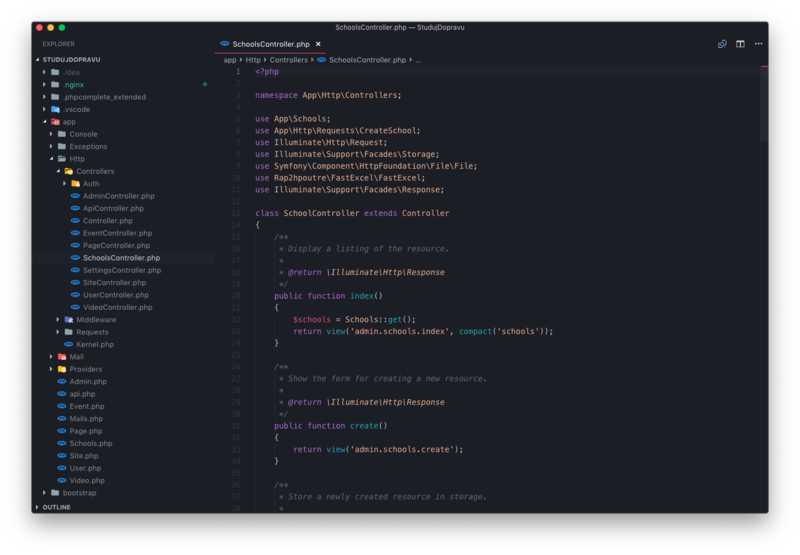 It’s really capable to do lot of things, even sometimes I feel like I can do more with VSCode than with PHPStorm, which is very pricey IDE. I have a really hand crafted setup, so I need to sync my packages and settings. The theme of choice is Horizon which is really cool vibrant theme. Also i’m using PHP IntelePhense for PHP Autocompletion. It’s really smart. Also some packages like Vetur, ESlint, EditorConfig are must have. For GoLang I’m using Go Extension, and same goes for ruby and python. Since I’m not using those 2 languages every day, I have just some simple extensions for them. I’m also using Visual Studio for C# and XCode for Swift development. 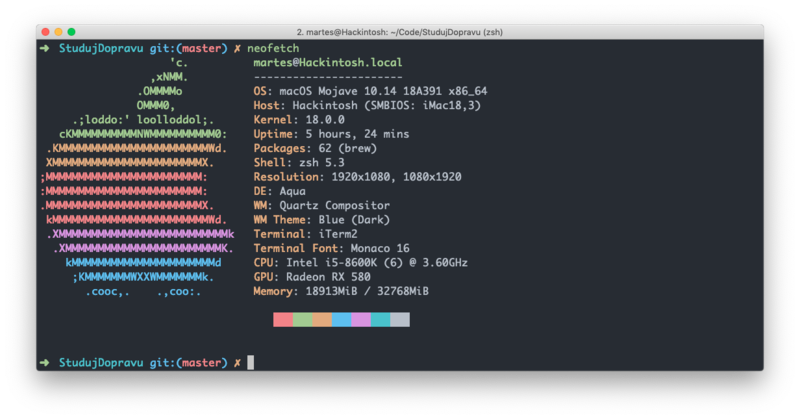 I’m huge CLI fanboy, so to ruin all your hopes, I’m not using bash but ZShell. Since it has plugin manager and all this stuff. Also it’s a lot more configurable. My dotfiles are here, but more than likely they’re broken, so use them only for your own risk. There are also some several apps I’m using from day to day basis. Simplenote as my primary note taking app. Todoist as my to-do manager. Spotify. My favourite playlists are Easy 50’s, Chill Vibes, Night Rider and Electro Swing genre like this. Discord, as my main communication platform for non work related stuff. GitKraken as my git client of choice. Alfred is really powerful spotlight alternative. And Pages. Yep. Pages, as my word alternative. Selecting hardware was really difficult, especially if you want hackintosh friendly hardware. So here’s mine. 250GB SSD, 2TB HDD & Everything is in the glorious Phanteks Enthoo Evolv. Hardware is really good. I can get my job done. Since everything is compatible with mac out of the box, maintenance for this machine is basically none. Even iMessages and FaceTime is working, yay! I can update operating system basically whenever new update pop up so I’m really happy about it.